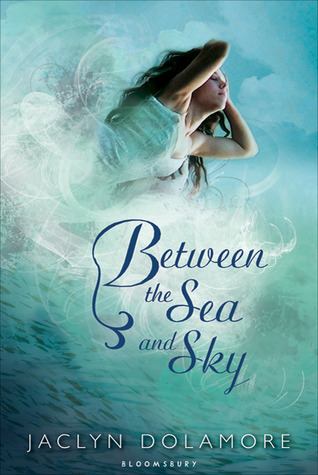 Between the Sea and Sky wasn't what I expected it to be. Being an extreme mermaid lover, I had wanted to really love this one, but unfortunately I didn't. I just kind of coasted through the novel. The only reason I finished it was because it was so short. My biggest problem with the book was that I never once connected to the main character, Esmerine. Her character never came to life for me. She felt very two-dimensional. As such, the romance she had with Alan suffered, because he didn't pop off the page either. There were some sweet scenes between the two of them, but for the most part, their romance didn't do anything for me, or for the story, I think. Plot-wise, it wasn't remarkable. I did like the concept of the winged people, and the sirens being the protectors of the mer-society, and I think that it had the potential to be a really epic storyline. But for the whole story, Esmerine was consumed with finding her sister, which wouldn't be a problem if it didn't take so long for her to fine Dosia. The plot dragged as a result. I've heard good things about Jaclyn Dolamore's other novels, so I'm not going to discount her from my to-read authors yet. I do want to try her other books, and see if I like them better. But, Between the Sea and Sky just didn't work for me. 2 out of 5 stars. That's a bummer to hear that this wasn't very good. I, too, am a big mermaid fan, but I have yet to find a book or series that I absolutely love. Maybe I'm just too picky. As much as I wish I had high hopes for this book I didn't. So I am really surprised that wasn't a win. The idea behind it was just too awesome. That said I am probably still going to try to read it. I am horrible at taking even my own advice. I liked this book ok, but I agree with everything you've said. I tried to approach it like a fairy tale--thin on character development, simple plot, straight forward. Nice, but nothing special. Her other book Magic Under Glass was more developed, but I think the plot was a little less tight than in BtS&S.